Readers of my original work won't be surprised I am urging people to read Marc Brouillette's commentary for the Council for Clean & Reliable Electricity. My criticisms of Ontario's Long-Term Energy Plan noted emissions would increase and the capacity requirements (of NERC) would not be met. Brouillette notes both these issues, and covers the economics of the flawed "Quebec import" suggestion that is now broadly dismissed. 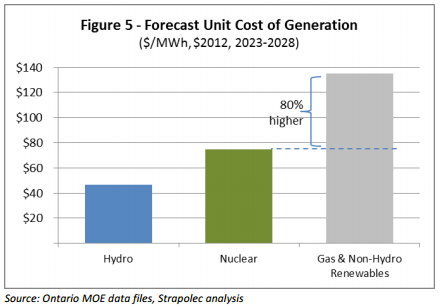 The 2013 Ontario Long-Term Energy Plan (LTEP) is a roadmap claiming to “provide clean, reliable and affordable energy Ontario will need now and into the future.” However, compared to other options in the 2010 LTEP it replaces, this 20-year plan represents a cost of $60 billion and 110,000 jobs to Ontario’s economy. As well, implementing this plan increases greenhouse gas (GHG) emissions by 50 per cent. Why these serious downsides? For one thing, the plan places too much emphasis on renewables, specifically wind, at the expense of reducing the nuclear power generation capacity that would best meet future energy needs. Independent analysis (Brouillette, 2013) has shown that, among the available supply mix choices, a greater emphasis on nuclear, such as in the previous 2010 LTEP, is a much better route to achieving the current plan’s stated objectives. against a better footing from which to build Ontario’s energy future. "Ontario will end 2014 with nuclear power providing about 60% of our electricity at 30% below the average cost of power in the province. That’s a fact." Duncan Hawthorne, president and CEO of Bruce Power, currently the largest operational nuclear power station in the world, has a commentary in the Toronto Sun today. Ontario will end 2014 with nuclear power providing about 60% of our electricity at 30% below the average cost of power in the province. That’s a fact. In a year where there has been a wide-ranging discussion about and attention paid to so many issues when it comes to energy, nuclear power has again been a topic that is largely absent from this discussion, both in terms of its importance and role. While this is often a disappointment to me, I accept that. Our job is to be there every day when people need us, in the cold winter and hot summer days, 365 days a year. This is a role we have played for decades and, I believe, should and will continue to play. We do this safely and have done so for decades. Our safety record in Canada speaks for itself. Canada is respected internationally with a strong, independent federal regulator with the Canadian Nuclear Safety Commission (CNSC). It’s only when we don’t have enough power that the discussion shifts to talk about the importance of nuclear. In recent weeks we have seen many examples in the U.S. when nuclear plants were not life extended and now there is a significant power crunch. The problem is, by then it’s too late." A ...spokesman said a decision had been taken to withhold the tables because it was “thought to be confusing”. I can write about the Ontario Energy Minister condescending remarks about complicated issues and people not understanding - and I can do so by quoting the exact same approach to obfuscation from across the pond! ...the tables showing the actual cost of green policies on future electricity prices for households and businesses in 2020 and 2030 were kept secret because they were “thought to be confusing”. Their release now will embarrass ministers, who are accused of presiding over an expensive consumer subsidy system. The Government’s climate change policies include complex consumer subsidies for wind and solar farms, as well as grants for energy efficiency measures such as loft and wall insulation, available to certain households. The introduction of smart meters, which it is hoped will encourage lower consumption, also helped contribute to rising electricity prices. Dr Constable said he had been told by informed sources that pressure had been put on DECC to withhold the tables. I was away for some of the week and missed a particularly poor report on a particularly lackadaisical scheduling of outages at Ontario nuclear generators. The planned shutdowns of two of Ontario's biggest nuclear plants during normally high peak times could mean soaring prices for consumers next year. The Bruce Power and Darlington Nuclear Generating Stations will be shut down at the same time next spring and summer for 16 weeks for planned repairs. There has been some recent interest in planned outages within Ontario’s nuclear fleet in 2015, specifically the Bruce B Vacuum Building Outage (VBO). This interest is not surprising given the importance of Bruce Power’s nuclear output to meet the needs of the province; however, additional context is important. The Bruce B VBO will be approximately a month in duration and commence in mid-April. Bruce Power works closely with the Independent Electricity System Operator (IESO) to ensure the timing of these outages can be accommodated to meet the needs of the system. These outages are approved just before they begin and discussions with the IESO will continue to ensure the system needs of the province are maintained. There are 4 reactors, so perhaps Bliss misinterpreted 16 reactor weeks as 16 weeks (not four weeks at each of 4 reactors). It would be interesting to know if the IESO is orchestrating this, or if Bruce Power and Ontario Power Generation (OPG) just didn't co-ordinate their outages. The Auditor General's 2014 Annual report is now out. It'll take some time to digest the full report, but in the interim, here are portions of the main news release, augmented with links to past articles by myself or Parker Gallant. (TORONTO) Ontario government programs that we examined didn’t always provide value for money or deliver services as effectively as the public has the right to expect, Auditor General Bonnie Lysyk said following the release today of her 2014 Annual Report. “Both of these two issues were at the heart of the 12 value-for-money audit reports we prepared this year,” she said after tabling the 600-page Annual Report, her second since becoming Auditor General in 2013. • Although nearly $2 billion was spent to install new “smart” electricity meters across the province, the government’s stated objectives of reducing power demand at peak times and eliminating the need for new sources of power are not being met. Parker Gallant, July 2010: Ontario’s Power Trip: Is this ‘smart’? Posts from Berkeley's Severin Borenstein usually interest me; the latest particularly so as it relates to a couple of issues I write on. The first is implementing carbon pricing where it's possible to do so - and the point is made that universities make great candidates. ...university action against climate change should start at home, with a campus carbon tax. All expenditures by campus units would be assessed a tax based on the GHG emissions associated with whatever they are buying or activity they are supporting. Of course, that raises issues like how large the tax should be and who should get the money, which I return to below." The idea is brilliant. First, it avoids the hypocritical appearance of the divestment movement, marking fossil fuel producers as evil polluters while happily continuing to consume their product. Second, it puts real incentives in place to reduce GHG emissions and sets a price against which reduction strategies can be compared. Third, and probably most valuable, it makes the campus grapple with all the difficult real-world issues that come with trying to implement cost-effective national or global policy for carbon reduction. In doing so, it creates teachable moments that could fill many courses and inter-disciplinary research projects. I've written on one area where carbon pricing can be introduced easily - Ontario's electricity system. From my Ontario perspective, "hypocritical" is something our largest universities are doing well, and "grabbling" with issues of higher energy costs something they are avoiding neatly. Hopefully this is repetition to readers of this blog - but in a very readable presentation from Barry Brook and Ben Heard. Single axis tracking solar photo-voltaic (tracking the sun in one axis). These costs are projected for 2020, based on recent trends in electricity costs using the metric “levelised cost of electricity” (LCOE). All of these technologies produce zero carbon emissions at the point of generation, and we would expect all of them would do well under a policy that sought a major increase in zero-carbon electricity. But these very different technologies also come with a range of economic advantages and disadvantages. For instance, solar panels and wind turbines have the advantage of incremental expenditure (you add relatively small amounts of new generation at a time) which is easier to finance. But the electricity they generate is at the whim of climate: without storage, they depend on the sun shining and the wind blowing. A joint study by "Toronto-based think tanks Energy Probe and Consumer Policy Institute" was released today; Corporate Welfare Goes Green in Ontario. The study is written by economist Brady Yauch, and I think it's excellent. There's an introduction to the study on the Energy Probe site, and an equally strong Background to Corporate Welfare Goes Green in Ontario. I can pick out some quotes and graphics, but both papers are more accessible than I usually make the topic. If you're interested in the topic, read Brady Yauch's work. 17 The government on September 30, 2014 raised the FIT rate to 12.8 cents per KWh. Let me explain why this set me off, and perhaps that will emphasize the work's claim that, "the benefits from [the province's renewable energy policy] have accrued to a small group of companies." September 30th struck me as about the time a deal was done between the Korean Consortium and the Ontario government for a 100MW wind project in Ontario - and it was, in fact, exactly the day. I checked today because of what I'd found when checking into Ontario's contract with the Koreans on, or shortly after, September 30th, 2014. Friday November 21st, Ontario and Quebec signed a "Memorandum of Understanding (MOU) to exchange electricity capacity." I can write much more on this, and may do so, but after providing a harsh rebuttal to the first of a number of dishonest and ignorant media reports on the agreement, I think it's now appropriate to note what content there is in the agreement is positive, if only understandable to the public service that achieved the MOU. At a joint meeting of ministers today in Toronto, the Ontario and Québec cabinets reached several agreements that will strengthen Ontario and Québec's partnership to build up Central Canada's economy, create jobs and make a difference in people's lives. Ontario and Québec have signed a Memorandum of Understanding (MOU) to exchange electricity capacity to help make power more affordable and reliable in each province. 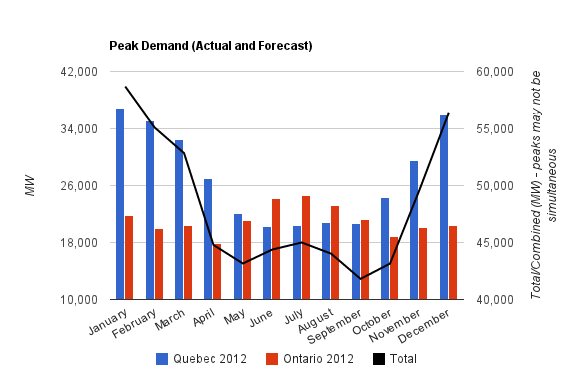 The Seasonal Capacity Exchange -- the first agreement of its kind between the two provinces -- takes advantage of the fact that electricity demand peaks in the winter in Québec and in the summer in Ontario. Starting in late 2015, Ontario will make 500 megawatts (MW) of electricity capacity available to Québec in the winter, and Québec will make 500 MW available to Ontario in the summer. This agreement comes at no additional cost to Ontario and Québec electricity ratepayers. It will help Ontario reduce future costs, by reducing the need to build new electricity generating stations after 2020, and it will help Québec meet its seasonal capacity needs. In 2007, when Google unveiled its initiative to make renewable energy competitive with coal, called RE<C, it represented a major breakthrough for the industry. ...Then, in 2011, Google stopped its R&D efforts prematurely. The article, by Ross Koningstein and David Fork, is fascinating. ...calculations cast our work at Google’s RE<C program in a sobering new light. Suppose for a moment that it had achieved the most extraordinary success possible, and that we had found cheap renewable energy technologies that could gradually replace all the world’s coal plants—a situation roughly equivalent to the energy innovation study’s best-case scenario. Even if that dream had come to pass, it still wouldn’t have solved climate change. This realization was frankly shocking: Not only had RE<C failed to reach its goal of creating energy cheaper than coal, but that goal had not been ambitious enough to reverse climate change. That realization prompted us to reconsider the economics of energy. What’s needed, we concluded, are reliable zero-carbon energy sources so cheap that the operators of power plants and industrial facilities alike have an economic rationale for switching over soon—say, within the next 40 years. Let’s face it, businesses won’t make sacrifices and pay more for clean energy based on altruism alone. Instead, we need solutions that appeal to their profit motives. RE<C’s stated goal was to make renewable energy cheaper than coal, but clearly that wouldn’t have been sufficient to spur a complete infrastructure changeover. So what price should we be aiming for? The resolution in the U.S. Senate opposing what became the Kyoto protocol passed unanimously, and then the Clinton administration signed on anyway - but it was never presented to the Senate for ratification. The American "commitments" at Copenhagen, which aren't binding, were taken from the American Clean Energy and Security Act that had passed in the U.S. House of Representatives in the prior months, but was not expected, and never did, pass in the Senate. I'm taking the U.S.-China Joint Announcement on Climate Change as a replay, coming, as it does, shortly after the Republicans gained control of the house; it's act III, but there is some interesting change from Act I (Kyoto). My hope is the announcement that Barack Obama is conceding a long-standing U.S. point prior to next year's climate negotiations, and concedes his administration will, appropriately, not attempt to take a lead role during those negotiations. A double: promising developments for CANDU technology, and some nice press coverage in Toronto! Jean Chrétien was in a good mood when he came to Shanghai in late 1996 to sell two Candu reactors. He kidded around with Li Peng, the then-Chinese premier, going so far as to try to place a red pompon on the head of the famously dour leader. Mr. Chrétien promised a future filled with more multibillion-dollar sales of Canadian nuclear technology to China. “I hope we will have many more Candus built in this great country of yours,” he said then. For the nearly two decades that followed, that optimism bore no fruit. Now, however, Candu Energy – divorced from the federal government and in the hands of SNC-Lavalin Group Inc. – says it is working toward a deal that could see it partner with a Chinese nuclear giant to build new reactors, both in China and abroad. By June, 2015, Candu hopes to finalize a joint-venture deal with China National Nuclear Corp., the massive state-owned atomic power and weapons company, “to develop global opportunities” for its advanced fuel reactor. The two sides signed an initial broad-strokes memorandum of understanding during the visit of Prime Minister Stephen Harper to Beijing this weekend. In the past week, a technical committee led by CNNC also gave its approval to the technology Candu intends to use, classifying it as a third-generation nuclear system that can meet post-Fukushima safety requirements. Following is a guest post written by Parker Gallant. I've collaborated with Parker on articles that have appeared in The Financial Post and on the Energy Probe site noted by Parker and the Broadbent Institute. I've previously posted articles from Parker that had no obvious home. A topic of those orphan columns were loans to a charity - MaRS - by an Ontario government body that didn't exist to give money to charities, but to fund Ontario's MUSH facilities. Years later the MaRS scandal is unfolding, as I hope a faux charity scandal will over time. The report doesn't claim authorship by anyone at the “Institute” but the writer's personal opinion is that it sure looks like the author is Rick Smith, formerly Executive Director of Environmental Defence and now ED of the Broadbent Institute. The report tries to glorify five (5) of the charities currently under audit by the CRA including the David Suzuki Foundation and Environmental Defence. Those charities claim some of their revenue was spent on “political activity” whereas the 10 “right leaning” charities didn't make those claims. I have penned several articles about Environmental Defence over the years when Rick Smith was their ED and more recently since Tim Gray took the reins. One of the earlier articles disclosed how much money ED had received from Ontario's taxpayers via the Trillium Foundation, Friends of the Greenbelt and the Toronto Atmospheric Fund. It was over $3 million! The Canadian Nuclear Association and Wind Concerns Ontario are both cited in a Forbes commentary pointing to the substantial studies that should be heeded to correct the poor EPA/NRDC proposal for a so-called "standard" to address U.S. electricity sector greenhouse gas emissions. If we want to arrest climate change, all we need are more renewables like wind and solar, right? Not exactly, according to a newly published Canadian report on lifecycle greenhouse gas emissions (“GHG”). 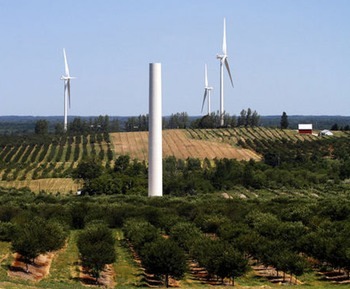 In fact, the report, which is based on 246 studies covering various power generation scenarios and constraints, concluded that nuclear power beats wind and natural gas on an ‘apples-to-apples’ basis for battling climate change. I commented on my "levelised cost" post on reddit - and that might explain how "apples-to-apples" comparison requires the systemic approach of looking at a wind + gas scenario. 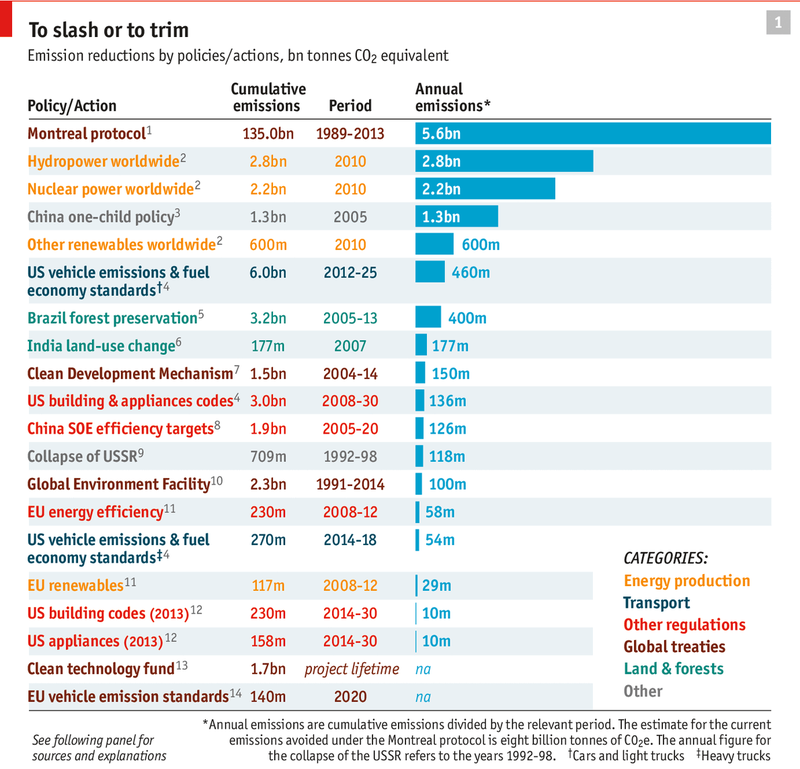 The emissions figures provided in the Hatch study didn't strike me as varying significantly from the emission ranges provided in the latest IPCC Working Group III documents, but on costing, and providing realistic supply mix scenarios, WG3's work is behind Hatch's. The deal reached at last week’s European summit on climate change will satisfy no one. ...The fractious debate which led up to the summit should be understood as marking the end of the “consensus” on energy policy established in 2008.
the negative effects of higher energy costs on competitiveness would be mitigated by a global deal with all the world’s major economies making progress towards the common goal of reducing emissions. The inconvenient truth is that none of these beliefs have proved to be true. Recently Subsidies and costs of EU energy: An interim report was released -within a week of my appearance on a panel discussing the policy implications of Hatch's Lifecycle Assessement Literature: Review of Nuclear, Wind and Natural Gas Power Generation. Onshore wind is cheaper than gas, coal and nuclear when air quality, climate change and human toxicity are taken into account, according to a study published by the European Commission. An analysis by the European Wind Energy Association (EWEA) of the data in the Ecofys report finds that onshore wind costs about €105 ($133) per MWh. Gas costs up to €164/MWh, nuclear €133 and coal €162-233. The interim report also presents figures on the cost competitiveness of the different power generation technologies. The estimated ranges reflect costs of new power generation without public intervention (levelised costs). Costs for producing one MWh of electricity from coal are in a range around €75. Electricity from onshore wind is generated at only somewhat higher costs. Costs for power from nuclear and natural gas are in comparable ranges around €100/MWh. Solar power costs have fallen considerably since 2008 to about €100-115/MWh depending on the size of installations. Ontario's Independent Electricity System Operator (IESO) and Ontario Power Authority (OPA) have issued a report on the prospects of replacing Ontario generators with contracted imports - with the focus being on imports from Quebec. from my "Quebec diversion: post"
The Review of Ontario Interties can be read, and/or the news release, and/or the backgrounder, but if you have read my Ontario's electricity future isn't this Quebec Diversion you'll not get much new out of them, I'd just read John Spears' brief summary in The Toronto Star. Ontario electricity planners have dumped cold water on the idea of importing big volumes of electricity from Manitoba and Quebec. There is “limited opportunity” for large amounts of long-term imports to supply the Ontario market, says the report by the Independent Electricity System Operator and the Ontario Power Authority. Importing from Quebec wouldn’t be cheap, the report says. It estimates that it could cost up to $2 billion to build new lines between Quebec and Ontario in order to import 3,300 megawatts of power. In addition, it says, Quebec would have to build new generating stations to supply the increased exports — and they would be more expensive than existing facilities. The New York Times steps towards recognizing the problems of intermittent energy systems. Solar panels and especially wind turbines produce vast amounts of energy, but on their own schedule, when the sun is shining or the wind is blowing. The more conventional installations — coal, natural gas and especially nuclear plants — earn their keep by selling energy around the clock. Put enough wind and solar units on the grid during the hours when they are running and they flood the market and push down the hourly auction price of a megawatt-hour of energy. Not everyone agrees. Most electricity markets have auctions not only for energy but also for capacity; utilities serving homes and businesses make what amounts to payments to assure that electricity will be available when needed. “We must be prepared to stand up to the bullies in the environmental movement and their subsidy-hungry allies." The Telegraph has an article on an upcoming speech by the U.K.'s former environment secretary ("sacked" this past summer). If nothing else, the article provides some great quotes on topics I frequently cover. The Committe on Climate Change issued a response to the news report cited below. 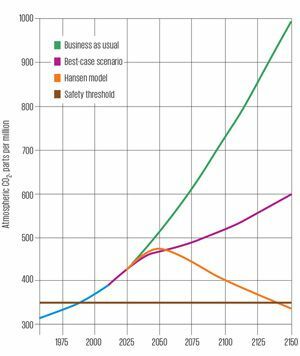 ...the current “decarbonisation route” will end with the worst of all possible worlds. The Government will have to build gas and coal power stations “in a screaming hurry”. Britain’s energy needs are better met by investing in extracting shale gas through fracking and capturing the heat from nuclear reactors, Mr Paterson will argue. He proposes a mix of energy generation based on smaller “modular” nuclear reactors and “rational” demand management. “We must be prepared to stand up to the bullies in the environmental movement and their subsidy-hungry allies. “What I am proposing is that instead of investing huge sums in wind power, we should encourage investment in four possible common sense policies: shale gas, combined heat and power, small modular nuclear reactors and demand management. The Boston Consultancy Group has a report on Germany's electricity experiment that is terrific; it is long and challenging, but should quickly become a reference work on the economic issues attached with Germany's Energiewende. Meanwhile, the Canadian media, and wind lobby, display an infantile understanding of the impact of trendy electricity policies in misinforming people - while engineers at Sask Power achieved an important first with carbon capture and storage. First, accentuating the positive, the article to bookmark and return to often is Germany’s Energiewende: The End of Power Market Liberalization? Fast-forward to today: Where does Germany stand in realizing its plan? Has progress met expectations? Does the country’s commitment to the plan remain strong? What are the implications of the ongoing energy transition (in German, Energiewende) for German society and industry, and especially for the country’s power sector? What are the implications for Europe’s power sector? This report seeks to answer these and related questions by assembling an objective fact base. One of the report’s key findings: Germany’s efforts may indeed transform the country’s energy profile as intended. But they will also likely lead to the end of power market liberalization in Germany and, very possibly, elsewhere in Europe. Anyone with an interest in energy economics should read Germany’s Energiewende: The End of Power Market Liberalization? This is good for Quebec, long term. It is also good for New York, which should see slightly lower rates, but maybe only for a while. New York's Governor wants to close nuclear, and that will more than cancel out the consumer benefits of improved connections with other jurisdictions. In a decision Wednesday, the Department of Energy said the permit requires some final concerns to be addressed by Albany-based Transmission Developers Inc. but otherwise clears the way for the 1,000 MW Champlain Hudson Power Express transmission line. The project has been in development since 2008. The agency said the decision was "based on consideration of the potential environmental impacts, impacts on the reliability of the U.S. electric power supply system under normal and contingency conditions, and the favorable recommendations of the U.S. Departments of State and Defense." A new article from Vaclav Smil, the always entertaining European accented Manitoba professor, is in the American online magazine. A superficial look might indicate great achievements. Yet a closer view reveals how far the European renewables have to go, and what irrational choices are made to meet EU green energy quotas. Germany produces half of energy with solar.” That was the recent headline on a German website of news in English, and it would have duly impressed anybody whose understanding of energy matters extends to just such headlines. But the headline, totally wrong, was also a perfect example of why it is so important to deconstruct the reports about green Europe. Undoubtedly, the EU’s promotion of wind and solar resources resulted in consumption shares higher than anywhere else, but the contributions are uneven and remain small in absolute terms... their contribution to the EU’s total primary energy supply remains very small: in 2012 about 1.1 percent for wind and not quite 0.5 percent for solar PV. Even in Germany their combined share of total primary energy supply was just 2 percent in 2012. Four companies today jointly proposed a first-in-the-U.S., $8-billion green energy initiative that would bring large amounts of clean electricity to the Los Angeles area by 2023. The project would require construction of one of America’s largest wind farms in Wyoming, one of the world’s biggest energy storage facilities in Utah, and a 525-mile electric transmission line connecting the two sites. “This project would be the 21st century’s Hoover Dam – a landmark of the clean energy revolution,” said Jeff Meyer, managing partner of Pathfinder Renewable Wind Energy, one of the four companies involved in the initiative. A key component of the project – a massive underground energy storage facility – would yield 1,200 megawatts of electricity, equivalent to the output of a large nuclear power plant and enough to serve an estimated 1.2 million L.A.-area homes. Read Duke Energy's full release, and if that floats your boat there's a video too. This doesn't look equivalent to "a large nuclear plant" to me. International new builds increasingly seem like a Russia, China and South Korea thing - mainly the first two if financing is part of the package. (Reuters) - South Africa signed a $10 billion nuclear power cooperation deal with Russia on Monday that paves the way for the building of up to 9.6 GW of nuclear power based on Russian technology by 2030, both sides said. The surprise announcement from the sidelines of a International Atomic Energy conference in Vienna suggests Pretoria is moving ahead with its plans for nuclear power, despite concerns over funding. "This agreement opens up the door for South Africa to access Russian technologies, funding, infrastructure, and provides proper and solid platform for future extensive collaboration," South African energy minister Tina Joemat-Pettersson said in the statement. NEW DELHI (Reuters) - China became the latest nation to line up for a stake in India's civil nuclear energy drive on Thursday, agreeing to open talks on cooperation in a sector that New Delhi sees as the solution to its chronic power problems. ..."I think the Chinese are looking basically at the commercial angle, since India is going to be giving contracts for nearly $150 billion in the next 10-15 years," said Srikanth Kondapalli, a China watcher at Delhi's Jawaharlal Nehru University. The announcement, made after Xi met Prime Minister Narendra Modi in New Delhi, comes on the heels of a deal India struck earlier this month to buy uranium from Australia to increase its fuel supplies. Days before that, Modi and Japanese Prime Minister Shinzo Abe agreed to accelerate talks on a nuclear energy pact. Nuclear power, which currently accounts for just 3 percent of India's output, is key to future energy plans in India, where a quarter of the 1.2 billion population has little or no access to electricity. 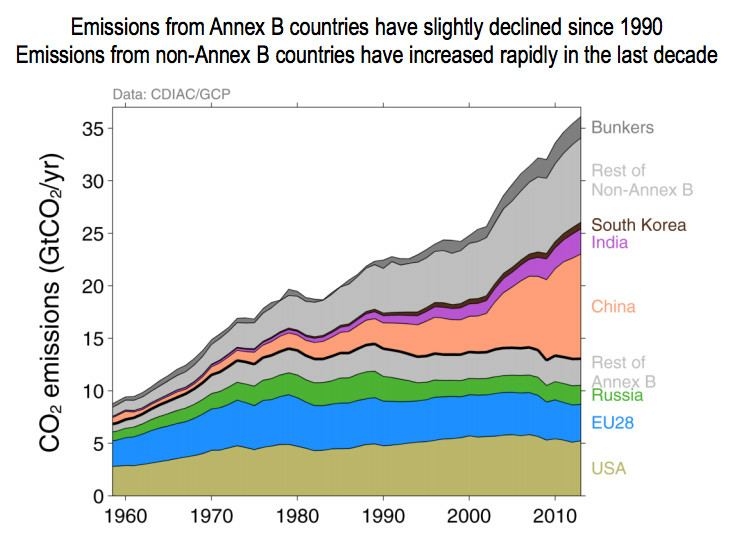 The casual reader might have the impression that there are real doubts about whether emissions can be reduced without inflicting severe damage on the economy. 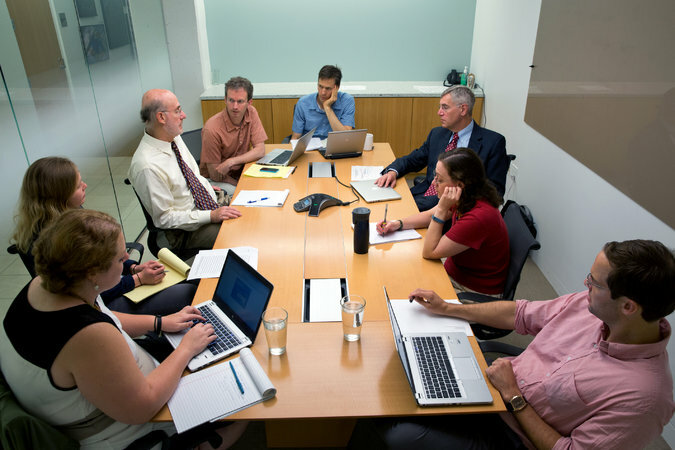 In fact, once you filter out the noise generated by special-interest groups, you discover that there is widespread agreement among environmental economists that a market-based program to deal with the threat of climate change — one that limits carbon emissions by putting a price on them — can achieve large results at modest, though not trivial, cost. I’ve just been reading two new reports on the economics of fighting climate change: a big study by a blue-ribbon international group, the New Climate Economy Project, and a working paper from the International Monetary Fund. Both claim that strong measures to limit carbon emissions would have hardly any negative effect on economic growth, and might actually lead to faster growth. This may sound too good to be true, but it isn’t. A good summary article from Maximillian Auffhammer. I'm really not sure if notable peope are wise enough to avoid noting the cap-and-trade purpose is to protect the apparently very powerful incumbant generators (and miners, etc. ), or if somebody, somewhere, actually thinks it's an honest alternative to a carbon tax. The National Development and Reform Commission, which is the arm of the Chinese government responsible for economic planning, has provided coarse outlines of a national market starting in 2016, which will cover 3-4 billion tons of CO2 with a volume of roughly 65 billion US Dollars by 2020. This is twice the volume of the European market. And some simple algebra suggests that the planners expect permits to trade at just below $20, which is higher than anywhere else in the world currently or in any of the regional markets in China. This is exciting news and will surely provide some significant momentum in the upcoming climate talks. I am somewhat puzzled by the apparent choice of a national cap and trade system over the other price based alternative to a CAT: a carbon tax. The reason I am puzzled is deeply rooted in some simple political economy. Cap and trade generates valuable assets (permits), which are frequently handed out to carbon intensive industries, which would otherwise fight the regulation and possibly prevent it from being implemented. If the government hands out permits, it gets no revenues from these permits. ... solar plants were rushed through the environmental approval process. Miles of unspoiled desert lands were scraped and bulldozed to make way for sprawling arrays of solar panels. Desert tortoises required mass relocation, and kit fox burrows were destroyed. Surprise troves of American Indian artifacts found in the Mojave Desert were moved to a San Diego warehouse, where they remain. And once it was built, the largest solar plant of its kind in the world - the Ivanpah installation in the Mojave - began igniting birds and monarch butterflies that fly through intensely concentrated, reflected sunbeams aimed at 40-story "power towers," according to a confidential report by federal wildlife officials. Owned by BrightSource of Oakland, with investment partners Google of Mountain View and NRG Energy of Houston, the 5.4-square-mile, $2.2 billion facility was built with a $1.6 billion federal loan and went online last fall. ...BrightSource underestimated how much natural gas it would need to run the Ivanpah plant when the sun doesn't shine. And scientists now say desert soils contain vast stores of carbon that are unleashed by construction of solar facilities. The entire article can be read at SFGate (affiliated with the San Franscisco Chronicle). Some believe that Ontario could tap into cheap imports from Québec to offset our substantially more expensive electricity. In reality, this is a complex technical and economic decision that would not reduce power rates in Ontario for many years to come. With the two provinces having somewhat complementary electricity load profiles, the current market-based imports and exports between the two are working as intended: each province has the ability to purchase electricity from the other province when market conditions are favourable to do so. There may be some point beyond 2018, when Ontario would need to procure additional resources to meet its adequacy target. If Québec could offer firm imports into Ontario when there is a need - at a cost cheaper than other available options - then a case could be made for firm imports. "According to sources close to these meetings, the deal involves a founding estimated in two billion dollars, aimed for Chinese products and services, including a third a country, and 32 billion dollars in Argentine origin suppliers. The new nuclear plant will be run via a CANDU reactor through natural uranium and heavy water, and is expected to reach a power capacity close to 800 megavolts. The complex will be built in Lima town, Buenos Aires province." The Wall Street Journal has an article today (subscription) which reminded me of an article I'd read last week. I've altered the WSJ article because I'm a poor gambler who knows some good ones - meaning people who know what facts they can, study the game, control their emotions and play the odds/stats. Germany didn't gamble like that. ...many companies, economists and even Germany's neighbors worry that the enormous cost to replace a currently working system will undermine the country's industrial base and weigh on the entire European economy. Germany's second-quarter GDP decline of 0.6%, reported earlier this month, put a damper on overall euro-zone growth, leaving it flat for the quarter. 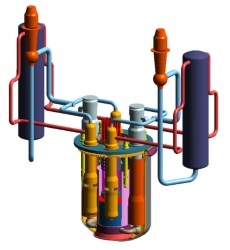 From source article: "GSFR's reactor system. circuit are immersed in a pool of sodium coolant. The dominance of a single party dedicated to a legislative goal was the precondition for Ontario to phase out coal. 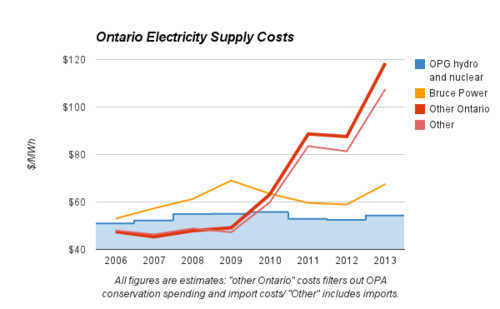 Ontario did not have a "war" on coal, it had a policy on coal-fired electricity generation. Ontario did not have only one party dedicated to the legislative goal - in fact it was a recommendation from the final report of an all party "Select committee on Alternative Fuel Sources", in June 2002, during the rule of another party, that, "...the Ontario government shall mandate the closure of all remaining coal or oil-fired generating stations by 2015." Discarding the reality of consensus with the silly "single party" hero, and "war", narratives, is the opposite of helpful in getting coal-fired generation reduced/eliminated in other jurisdictions. The U.S. Energy Information Administration has a quick post today on the displacement of coal and oil-fired generation with natural gas and imports, primarily from Canada. Electric operators in New England have been both generating more electricity from natural gas and importing more hydroelectric generation from Quebec over the past decade. These two sources of electricity are displacing the use of coal and oil as generation fuels in New England. Geoff Russell has an e-book out, titled, GreenJacked! : The derailing of environmental action on climate change. I'd tweet him (@csiroperfidy), but then he'd just respond he'd prefer I put a review on Amazon. I don't write book reviews, and this one would be rather sycophantic - which I also tend not to write. A very brief review for those who know me well. I bought the e-book, which itself is like getting blood from a stone. And the review for those who know me and give me books: I read this one - right until the end. If you are open to a reasoned argument for why fear of radiation exists, why it is grossly exaggerated, and not virulently opposed to learning some of the many things you do that are far more likely to cause your cancer than radiation, Russell's little book is an accessible entry into the subject. As a carnivore, I'll suggest you get Joe Jackson's Everything Gives you Cancer going through your head before Russell informs you of some things worse than the radiation levels around, for instance, Fukushima. One example; "wurst is the worst." Not willing to shed ~$4 for an e-book?